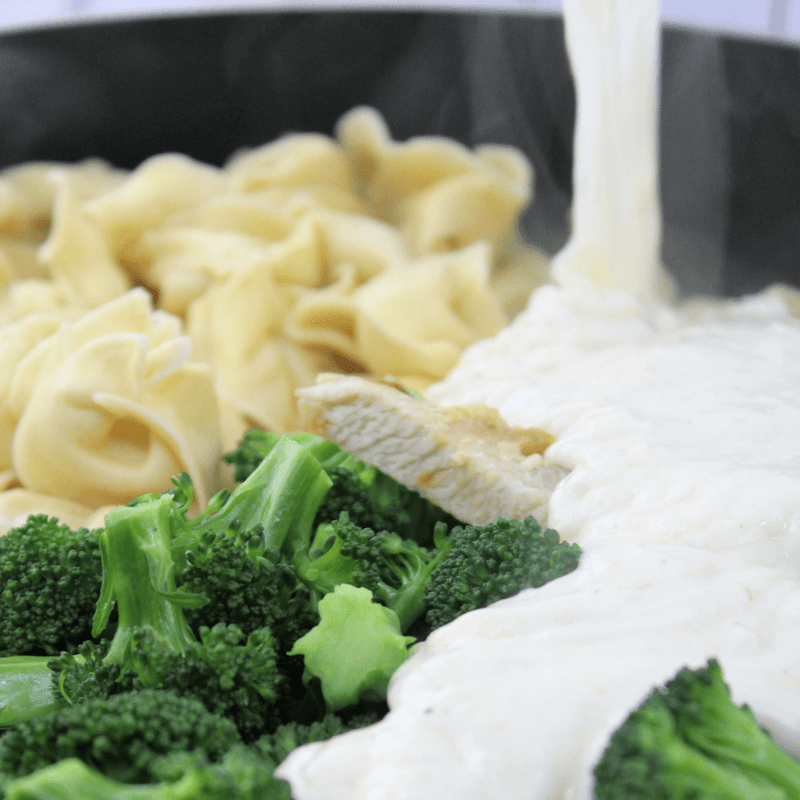 Chicken with Broccoli Tortellini Alfredo made with chicken, cheese filled tortellini, fresh broccoli, and a creamy parmesan packed garlic alfredo sauce. Pasta is a huge comfort food for me. Any type of pasta from spaghetti to carbonara to tortellini. Add in a great hearty alfredo sauce and I am in food heaven. I am picky about my alredo sauce though. I don’t like it bland or too watery so I made this alfredo sauce with loads of cheese and garlic and used some flour to thicken it slightly. The broccoli is a nice addition to this dish. the broccoli adds a crispness and freshness to the dish. 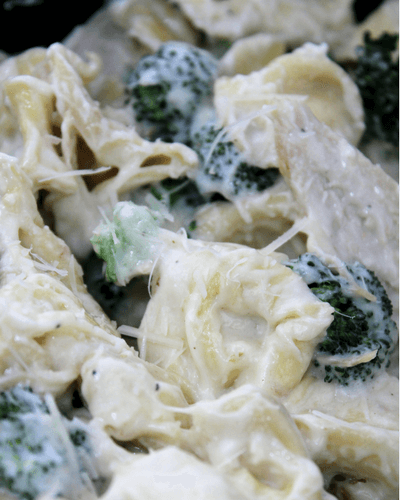 Plus, the alfredo sauce covers up the vegetable for any picky eaters in the family. We all have at least one of those in the family! Make sure not to cook the broccoli too long. Keep it bright green and crisp. I boiled them in a pot today for 4-5 minutes and they were just right for this dish. Check out all that creamy goodness! 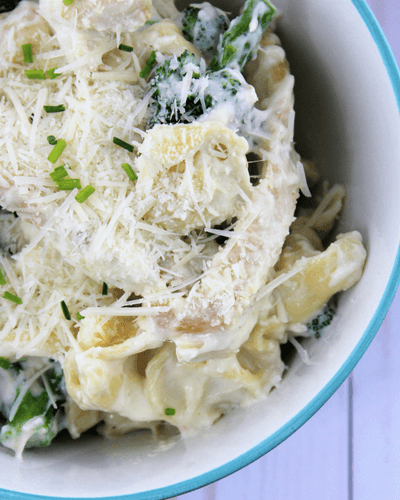 Chicken with Broccoli Tortellini Alfredo is so creamy and delicious. When making your alfredo sauce, don’t be afraid to add in that parmesan and garlic to amp up the flavor factor. I also add in a little cream cheese to the recipe to help create a smooth sauce. Today, I placed the chicken on the stove top with some extra virgin olive oil to get a nice brown on the outside and keep the juices all inside. Cook for 10 minutes on each side and done. No extra seasoning or anything special is needed. Keep the chicken simple. You can also grill the chicken which would be really nice to add in that hot off the grill charred flavor profile. Fillet a large chicken breast (about 1 pound) into 2 pieces. Heat a large pan on medium heat. Add olive oil and chicken breast fillets. Cook for 10 minutes or until the edges are white and flip for another 10 minutes. Cover the chicken with a lid. As the chicken cooks, boil water in a large pot. Add broccoli into boiling water and cook for 5 minutes. Strain broccoli from water and set to the side. In your large pot, cook the tortellini according to the package directions and strain. When the chicken is finished cooking, remove from pan and slice. Keep to the side. In the pan, make your alfredo sauce. Add the flour and butter and whisk while slowly adding in the heavy cream. Add the cream cheese, minced garlic, salt, pepper, Italian seasoning and whisk until thickened and smooth. Add the 1.5 cups parmesan cheese and turn off heat. Whisk well until melted and creamy. 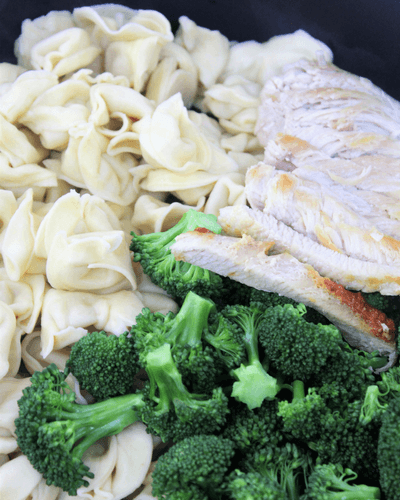 Add the broccoli, chicken slices and tortellini to stir together. Serve with some extra parmesan cheese if you like. Really enjoyed the alfredo receipe, not sure if I’m ready to venture out making the sauce tho, so I’m gonna add the jarred for a cheat…..and plan a salad as a small side also. Try the alfredo sauce- so much tastier than the jarred stuff! 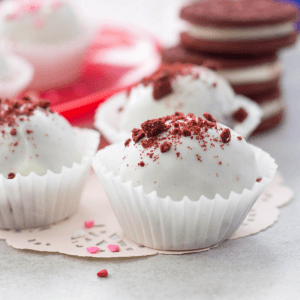 This looks so indulgent! I’m totally saving this recipe for a Sunday night dinner! What a great comfort meal! For sure! Pasta is a huge comfort food for me. Oh my gosh, tortellini and alfredo, that sounds like a deadly combination. I definitely need to make this for my kid! Haha, your kid should love it! This looks delicious! 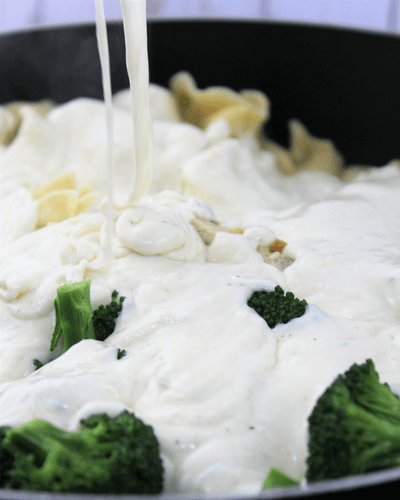 I have always made tortellini recipes with a marinara sauce but never an Alfredo sauce, I will definitely try this one cause i love Chicken Alfredo!! I’m pinning this to my food group as well. Thanks for sharing this! Thanks Trish! Enjoy! Cant go wrong with chicken alfredo.